JOHN P. KELLY—One of the foremost figures in legal circles in Rensselaer County, New York, is John P. Kelly, who for upwards of forty years has been active in the practice of the law, and whose success has long been a noteworthy fact. In private practice and in public service, Mr. Kelly has done much for the general advance, and he is honored among his contemporaries in this and other professions as one of the thoroughly progressive and broadly representative men of the day in Rensselaer County. Mr. Kelly is a son of Patrick Kelly, who was born in Ireland, and came to the United States as a young man, settling in North Greenbush, Rensselaer County, New York, where he became a prominent contractor. He was later active for many years as superintendent of the Troy Gas Light Company. John P. Kelly was born in Troy, New York, February 16, 1862. His education was acquired at the public schools of North Greenbush and Troy as far as the grades, and for a number of years thereafter he was employed in various ways, learning the molder's trade in the Clinton Foundry during this period. He worked at this trade while studying law in the offices of Thomas Neary, a distinguished lawyer of that day. 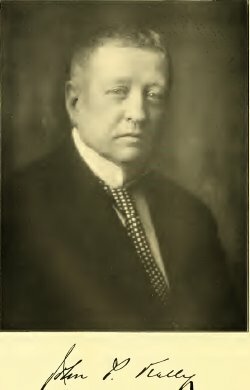 He was later admitted to the bar of the State from the office of the late Judge E. Smith Strait, of Rensselaer County, and immediately thereafter, in partnership with the late Judge Robertson and the late Samuel Foster, he became a member of the firm then organized, Robertson, Foster & Kelly. Formed in the year 1885, this partnership continued for about three years, then Mr. Kelly withdrew to accept the office of assistant district attorney, by appointment of the late Hon. L. E. Griffith. Upon the elevation of Judge Griffith to the bench of Rensselaer County, as county judge, Mr. Kelly was appointed district attorney by the late Governor Hill. This was in the year 1890, and by subsequent elections Mr. Kelly was retained in that responsible office until the year 1897, inclusive. His original appointment was the result of his excellent service as attorney for the Rensselaer County Board of Supervisors, (1886-88) and in all his public activities he has wholeheartedly sought the greatest good for the people and for the county as an organized public administrator. He served under the leadership of ex-Senator Edward Murphy; was chairman of the executive committee of the Democratic organization of the county; and also served as chairman of the Democratic County Committee under the leadership of Joseph Murphy until about three years ago, when he resigned his chairmanship in that organization, devoting his time and energy to his various other interests and not taking a very active interest in politics since that time. For more than a quarter of a century Mr. Kelly's private practice has so fully commanded his time and energies that he has accepted no further public responsibilities of an official nature. He has always practiced in partnership with noteworthy associates, the original firm giving place many years ago to the partnership long prominent as Foster, Kelly & Isenburgh, which association was by mutual consent dissolved, and he is now engaged in active practice alone. With spacious offices at No. 5 State street, his surroundings are in accord with his professional dignity. He is a member of the Troy Chamber of Commerce, and alert to every phase of civic and social advance. Mr. Kelly is past president of the Young Men's Catholic Literary Association, of which organization he was for many years a leading supporter. John P. Kelly, married, November 12, 1887, Helen J. Fleming, daughter of James and Helen (Holmes) Fleming, and they are the parents of: Kathryn J., who married George J. Summers, a leading member of the Mosier & Summers Company of Buffalo, New York; James E., who is now holding a responsible position in the employ of the J. S. Bache Company, of New York; Helen J., who married Edmund J. Dufify, who is connected with DufTy-Healey, Incorporated, in Troy, New York. The family residence is at No. 1 Washington Park Place.